Top : Boatbuilders : Ron-Ka Yachting Co. Established 1967. Yacht Builder catered to construction of traditional Turkish Gulets using master carpentry with 3,000 square metre fully enclosed hangar plus additional dockspace and 300 ton lift facilities. 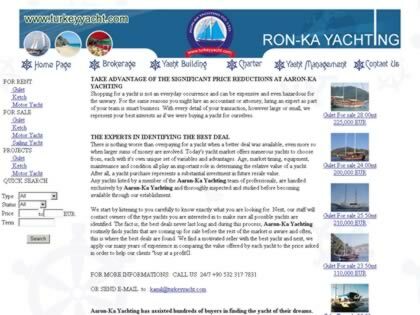 Web Site Snapshot: If available, above is a snapshot of the Ron-Ka Yachting Co. web site at http://www.turkeyyacht.com as it appeared when this site was added to the directory or last verified. Please Note that Boat Design Net has no involvement with the above web site; all content and images depicted in the above thumbnail are the property and copyright of Ron-Ka Yachting Co. unless otherwise noted on that site. Description: Established 1967. Yacht Builder catered to construction of traditional Turkish Gulets using master carpentry with 3,000 square metre fully enclosed hangar plus additional dockspace and 300 ton lift facilities.